Compare the offers of car rental services in Regensburg on Driveboo and find the cheapest rental car. Regensburg is located in the heart of Bavaria. Rent a car to get to know this lively and versatile city. With a rental car you will always be flexible and able to go wherever you wish according to your desire and mood. Explore the city centre, stroll along the banks of the river and drive to all the interesting sights in your rental car. There are many ways to reach Regensburg. You could start in Berlin, Hamburg or Stuttgart and drive to the Bavarian city in your rented car. If you prefer to fly from Berlin to Munich, you could pick up the rental car at the airport. With a rental car your trip will be cheap and flexible. On our comparison portal Driveboo you will find many attractive offers to choose from. The earlier you decide, the better the offers will be. In the case of an emergency, you can cancel your rental car up to 24 hours before the agreed pick-up date. After landing you can pick up your rental car directly at the airport car rental counter. That way you can drive to your destination in a self-determined and inexpensive way. To get from the airport to Regensburg, you have to drive about one hour with normal traffic. Therefore the journey via the airport is one of the fastest ways into the city. Porta praetoria: Immerse yourself in the time of the ancient Romans and drive to Porta praetoria with your rental car. The 2000 year old building was used as a gate. Later its remains were integrated into the bishop's court. Therefore the Porta Praetoria is well preserved until today. Regensburg Cathedral: The majestic St. Peter's Cathedral rises far above the roofs of the city. The cathedral was built in Gothic style. It has an impressive double tower, which decisively shapes the cityscape. Inside the large building there is a detailed silver high altar. Regensburg Cathedral is located in the middle of the medieval old town, which has been a UNESCO World Heritage Site since 2006. By rental car you can get to know the historic quarter comfortably and cheaply. If you decide to rent a car, you will need a suitable insurance. This is automatically included if you book on Driveboo. You will find the exact conditions of your insurance in the rental conditions. Use our filter function on Driveboo and choose your desired options. You will find suitable offers at favourable prices, where the desired insurances are already included. Therefore, don't let the car rental company talk you into additional insurance on site. These are usually superfluous. 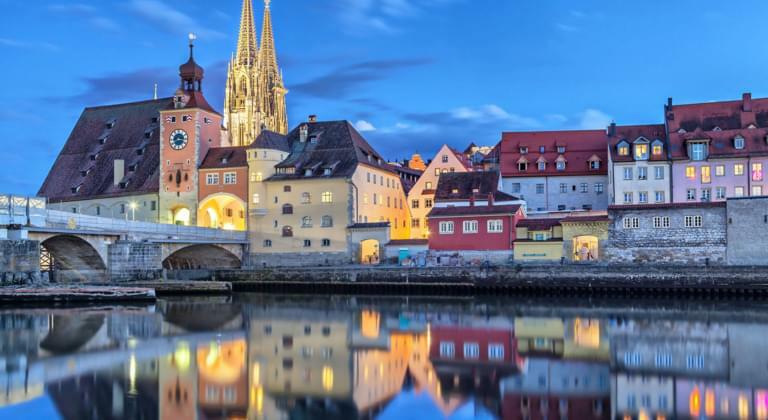 Regensburg is an excellent starting point for a round trip through Bavaria. You can travel to Nuremberg and move on to Munich. Alternatively, you can fly from Berlin or another city to Munich, start your round trip at the airport and end it in Regensburg. If you want to explore Germany by car, you can also take a road trip from Berlin to Bavaria. If you want to rent the car at one station and drop it off at another, use the one-way rental service. On Driveboo you can compare prices and book offers for one-way rentals. Some providers charge an additional fee for the one-way rental, which is not included in the rental price. You can find the amount of this fee in the rental conditions. If you are not travelling alone, you can register your company as an additional driver. The person is thus included in the insurance cover and is also entitled to drive the car. The registration can take place on the spot at the car rental when you pick up your car. The additional driver must present his driving licence and identity card in the same way as the main driver. Compare all offers on Driveboo. So you will find a car that is cheap and meets all of your wishes. Do you have any further questions about your rental car? Our service team will be happy to help you!